Is the Creative Labs Sound Blaster Recon3D Omega the ultimate gaming headset? The Creative Labs Sound Blaster Recon3D Omega undoubtedly wins the prize for the most unwieldy name in the world of gaming headsets, but it has loftier ambitions than that – it is, simply, the sound card manufacturer's flagship attempt to set new standards at the very top end of the gaming headset pile. It has all the bells and whistles a pro gamer could desire, including a Scout Mode designed to bring the sound of approaching enemies' footsteps to the fore, the company's own THX Surround Sound (claimed to be better than Dolby 5.1, although it supports that, too), a noise-cancelling microphone and even a wireless dongle that contains its own, quad-core sound card. 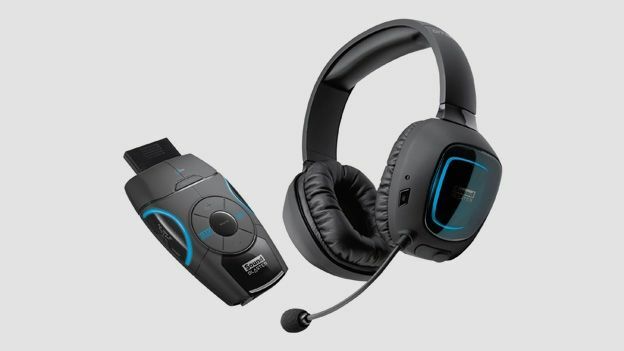 With a £209.99 recommended retail price, it's clearly not aimed at occasional gamers, though – do they really offer that much more than rival headsets like the £130 Sennheiser PC 360 G4MEs or the Gioteck EX-05, which you can pick up for an astonishing £40? You'd expect flawless design from the Sound Blaster Recon 3D Omega, given its price-tag, and happily, it doesn't disappoint. It's a sturdy, classily finished headset, with a pretty classical look, which is clearly built to last – and it pointedly avoids the garishness of many of its rivals. It comes with a pretty large box of tricks that connects to PC or consoles via USB and both governs the wireless connectivity and contains the sound card. You'll want to have that within your reach, as it also lets you trigger Scout Mode, THX Surround Sound or mute, and the USB to mini-USB connector could be longer. But that's the only design quibble. The microphone is one a sturdy boom that retains its shape, and there are volume controls on both the headset (the back of the left earcup) and the dongle. Setup can be a knotty issue with gaming headsets designed to operate across a range of consoles – especially with the Xbox 360, if you're inclined to use an HDMI connector. The Xbox 360 was designed to provide audio out and mic in via its controllers – in a classic example of insanity that can only be explained by Microsoft's desire to get people to use its (thoroughly inferior) headsets, so with most gaming headsets, you either have to get an adaptor that fits into the controller or one that goes into the AV-out socket on the back of the machine. However, the Sound Blaster Recon 3D Omega takes a different – and better – approach, supplying an optical cable that fits into the dongle, alleviates an awful lot of fiddling around and also works on the PS3. Setup with a PC or Mac could not be simpler – you just plug the dongle in via USB, and forget about the computer's built-in sound-card, as the dongle contains its own, superior one. There's also an application provided for fine-tuning the sound on your PC. Frankly, everybody who makes cross-platform gaming headsets ought to copy Creative Labs' approach with the Sound Blaster Recon 3D Omega. Again, anything less than unimpeachable comfort would be unacceptable for a gaming headset that costs two hundred quid, and the Sound Blaster Recon 3D Omega delivers once more. There's a thick foam covering underneath the headband, gloriously cushiony earcups (with a bit of tilt-give in them) and enough horizontal rotation for you to get them to fit perfectly, no matter how much your ears stick out. You would say that it's an average-weight headset. The closed-back design cuts out ambient noise well, but may make you sweat in the course of prolonged gaming periods in hot rooms. But make no mistake: the Sound Blaster Recon 3D Omega is an extremely comfortable headset. In the rarefied world of competitive multiplayer gaming, different aspects of sound quality in become key depending on what game you're playing, but the undoubted pinnacle – when a good headset can make the difference between defeat and victory – lies in the first-person shooters like Call of Duty and Counter-Strike. With such games, a good surround-sound system, enabling you to feel which direction bullets are pinging in at you from, is crucial and, in this respect, the Creative Labs Recon 3D Omega is exemplary. 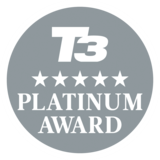 We're not quite convinced whether the THX system is better than Dolby 5.1 – in the end, it's a matter of taste. But switching between them is easy. Another crucial feature is the ability to lower in-game sound effects when, say, you're dug in and sniping, so that you can hear (and locate) the footsteps of incoming players, and that's exactly what Scout Mode does, in an almost uncanny manner. Ally those features to great all-round sound – crisp bass (which perhaps gets a bit boomy with THX toggled on), rich mid-range and a top end that never gets shrill, and you've got everything that even the most dedicated (obsessive, even) gamer could desire. And if you just want to use the Creative Labs Sound Blaster Recon 3D Omega to listen to music or movies, it will still make you happy. Creative Labs set out to make the ultimate gaming headset with the Sound Blaster Recon 3D Omega, and it succeeded in spectacular fashion. We would defy even the pickiest professional gamer to find anything wrong with it. It's beautifully constructed so, even if you aren't someone who spends your life playing Modern Warfare 3, you should find it's the only gaming headset you'll ever need. Sure, it's pricey, but whether you're hooking it up to a PC, Mac, Xbox 360 or PS3, and whether you're into a driving game or World of Warcraft, it will meet your requirements with ease.